Built in 1862 by Engelbert Haller and Kasper Koch, this lovely Greek Revival building was originally built to operate as a general store and served as the township’s stagecoach stop; however, two years after completion it was sold to Jacob Schneider who used it as a tavern and hotel. The tavern and store were located on the main floor (now the living room and office), with simple accommodations to rent upstairs. A separate entrance on the side of the home was used so guests could access the rented rooms and store without passing through the tavern, and is the reason why the main staircase is located behind the front rooms and not at the front of the home (like residential homes of the era). The Schneider Tavern was in operation until 1887 when it was sold to the son of Evert Westervelt. Evert Westervelt arrived to the area from Pennsylvania in 1852 and is the founder of the small town of Frontenac, originally named Westervelt. Having opened a local limestone quarry of dolomite shortly after his arrival (which supplied all the local limestone foundations, walls, and tombstones), he purchased a total of 320 acres of land as the site of his new town and began the process of plotting streets and lots to sell to future settlers. In 1859, the town was renamed Frontenac in honor of Louis de Buade de Frontenac, governor general of Canada between 1670-1698. (Minnesota did not become a state until 1858). 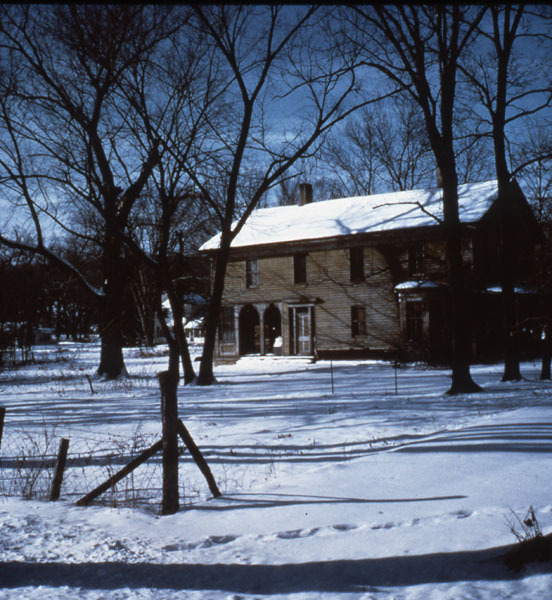 The home stayed in the Westervelt family until it was purchased in 1982 by a couple who began the restoration process and opened the home as a bed and breakfast. In 1999, the current owner purchased the home, and over a decade, restored and updated the home further, including the restoration of the front porch. Using old photos, the owner was able to recreate the original design and trim detail. Photo of the home pre-bay window on the side of the home. Old photos of historic homes are extremely useful for restoration efforts and determining what architectural elements were original or added in later decades. For instance, the Schneider Tavern, was not originally built with a bay window on the southern side of the home, to the left of the porch. 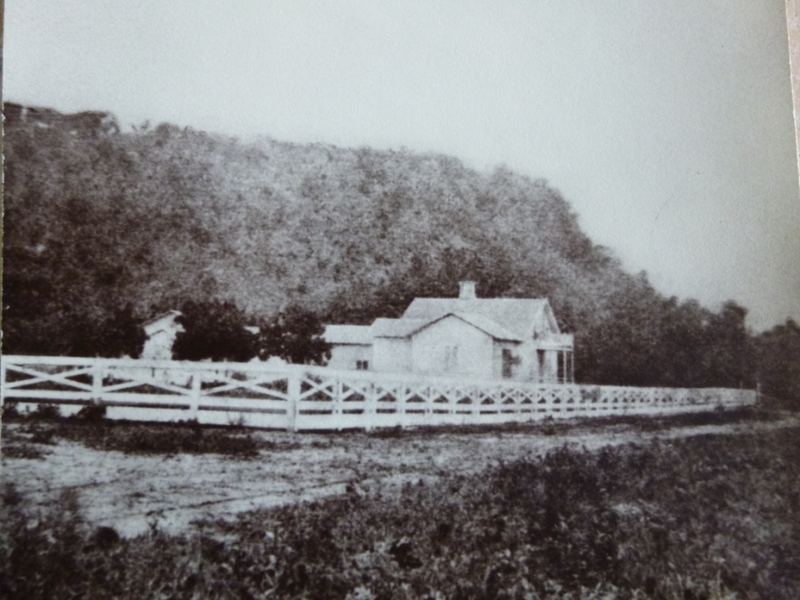 It was added later, sometime after 1891, when Westervelt purchased the home and used it as a private residence (we can surmise that the above photo was taken after 1891 simply because that was the year the American company of Anchor Post and Fence bought the patent rights to the chain link fence from a United Kingdom company and began production in the United States). From what I have read in a book about Frontenac, there is a question on whether the Moorish attic windows were added later, but looking at old photos and the design of the home, it appears they are original to the structure. 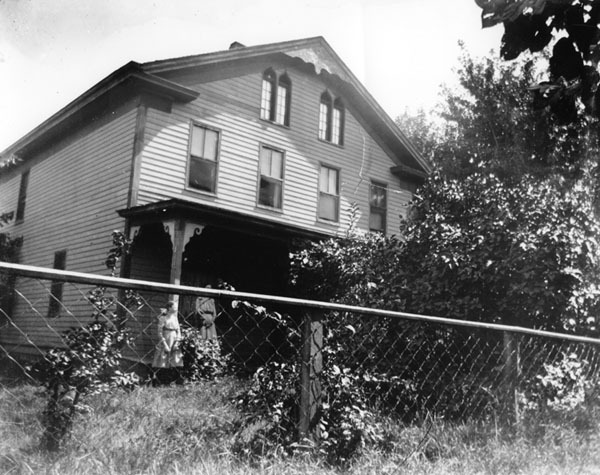 Other questions have been asked about the decorative gable trim (if it was added by more recent owners), but again, old photos show the gable trim and porch brackets date to at least pre-1887. This home is currently “pending” for sale. Additional information, photos, and an interactive 3-D tour can be viewed at the property website. Original limestone horse hitching post that was quarried from Westervelt's local limestone quarry. Original limestone stagecoach steps that were quarried from Westervelt's local limestone quarry. Up close photo of the Moorish attic windows and decorative gable trim. 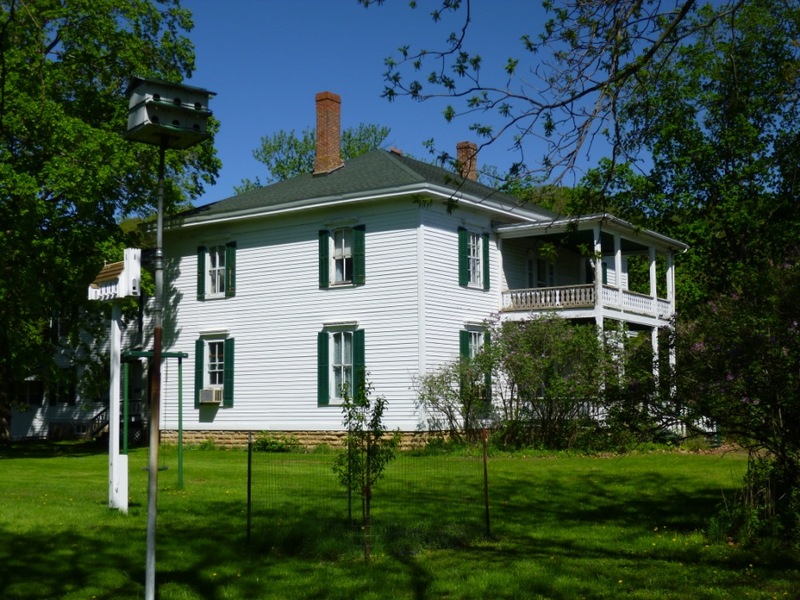 It was in 1859 that Lewis Garrard moved to Frontenac (thus named the same year) and built a small one and a half story house with a few one-story wings coming off the main house. 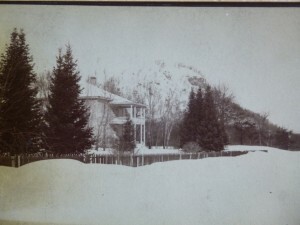 The main entrance faced the lake, had a small porch and balcony, and the property was surrounded by a white fence. He had been here before eight years earlier with his brother Israel, both men looking for land and investment opportunities. While his older brother stayed and became part owner of the town (called Westervelt at the time) with Evert Westervelt, Lewis traveled back home to Cincinnati and then on to Europe. After his return, Mr. Garrard married in 1862 and decided to expand the home for his new family. The original house was turned into the larger, two-story home we see today, with hipped roof, covered front porch with sleeping porch above, larger double-hung windows, decorative lentils, and shutters. Later, a one story, northern wing that housed his medical office was removed and moved a block south. In 1869, scarlet fever was sweeping through the small river towns. Lewis Garrard’s two young sons were stricken with the illness and later died. Devastated by their loss, the Garrard family moved to Lake City. Amazingly, they did not sell the house, but maintained it for the next 56 years, finally selling the home in 1926. It was purchased by Ted Hall, son of Osee Hall, a long time friend of the Garrard family. How long they owned it, I am not sure, but the home has been with the Hodgson family since 1960. Selling or Buying an Old Home? 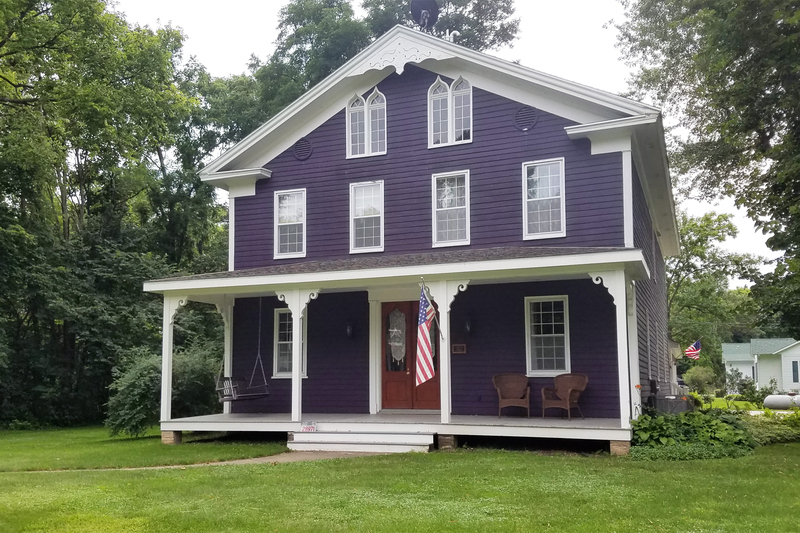 Need help selling or buying a Minnesota Historic Home? Give me a call or send an email and I'll get to work!